War By the Shore is a mixed Martial Arts event held at the Embassy suites Monterey Bay location in Seaside, CA presented by REALITY LLC. This will be an action packed night of fun with Amatuer Mixed Martial Arts Fights, Music all night provided by Dj Neato Live, and performances from various artis. 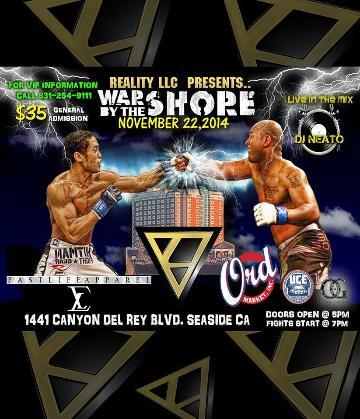 This event is the first of its kind in the Monterey Peninsula as the finale of the "Golden Warrior Challenge", (an amatuer round robin tournament that consist of competitors from all over the Monterey County where they compete to get to the finals and showcase their talent infront of the entire area at "war By The Shore, Saturday November 22nd). Wether your coming in a week early for Thankgiving break to see the family or you need something to keep incoming family entertained, War By The Shore is the place to be Saturday November 22nd! We look forward to bringing you a great time and putting on a show, see you there!